AssetCollector is a robust asset management component that automates the acquisition of file-based delivered broadcast content, both syndicated programming and commercials. AssetCollector replaces third party tools used to acquire file-based delivered content to free your operation from base-band to bring content into your play-to-air server. AssetCollector eliminates inefficient and less cost effective methods. Florical provides the far-reaching monitoring for new content on file-based delivery servers. AssetCollector includes the transcoding of such content, the processing of associated metadata and the transfer of assets to the broadcast play-to-air servers. And while all this is being done, AssetCollector updates your automation system. Simply put, AssetCollector knows what is coming and is ready to grab it. AssetCollector monitors the content servers via their respective native LAN based API and discovers new content as it arrives on the servers. The content is only acted upon when AssetCollector expects its arrival. This is typically the case for programs and commercials that are tied to orders and dub lists. 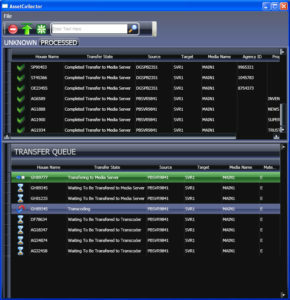 AssetCollector integrates into SMART Central and uses the Vantage transcoding engine. Automates acquisition of file based content. User interface displays status of content movement. Prepares content for air from commercial edge servers. Content arrives ready for air. Assets can be aired with no timing or renaming. Automatically transcodes material to play to air servers format.